UK deploys Chinook helicopters in Mali. 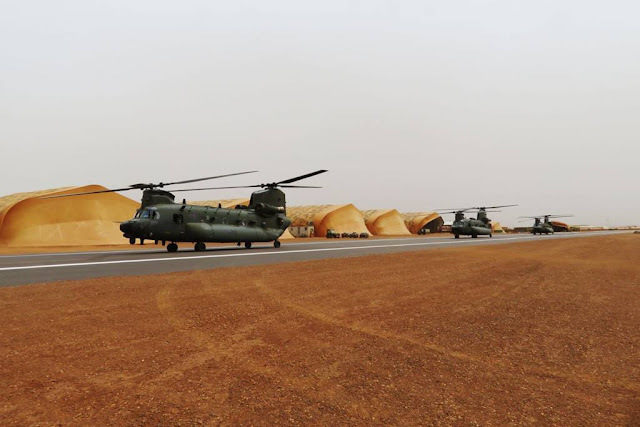 Three Royal Air Force Chinook helicopters from RAF Odiham, supported by RAF ground personnel, have now arrived in Mali and are preparing to begin providing logistical and troop movement support to a key French counter-terrorism operation. “The UK and France have a unique security and defence relationship that has lasted for more than a century and this deployment demonstrates our shared commitment to tackling terrorism, instability and reducing threats to European security”, Armed Forces Minister Mark Lancaster said. The Chinooks will provide niche logistical support and will also help improve safety by moving troops by air, rather than ground, where they are more vulnerable to attack.